Negotiating the release of a convicted terrorist will significantly increase the prestige of ISIS in the eyes of many jihadists. Fox News—Jordan has agreed to demands from ISIS that it release a female jihadist held since 2006, in a move that could free a Jordanian pilot captured in Syria last month and possibly a Japanese journalist who pleaded for his life in a video released by the terror group on Tuesday. 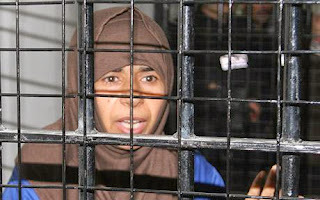 Jordanian government spokesman Mohammed al-Momani said in a statement the nation was prepared to free Sajida al-Rishawi, who was convicted of taking part in a deadly hotel bombing, if the Jordanian pilot, Lt. Muath al-Kaseasbeh, is released unharmed. His comments were carried by Jordan's official Petra news agency. Although he made no mention of Japanese journalist Kenji Goto, a hostage audio message released by Islamic State a day earlier tied Goto's fate to that of Al-Rishawi, as well. Notice they are only willing to exchange on of their own and the leave the dirty Japanese kuffar to die. Agreed. Aside from possibly and only possibly saving two lives, this move will bolster ISIS' image first and foremost. It's a death sentence either way for Sajida, so I'm suspecting that's the Jordanian rationale. you are one of those "americans" who gets the news from a "christian radical hate other religions" TV... how much does Rupert Murdoch pay you for this? I understand that you are upset but SG's comment is actually quite factual. The Jordanian government understand ISIS a lot better than most people in the West and knew their chances for an exchange were slim. It was perhaps pressure from the people that made them relent, which in turn demonstrated that ISIS could control governments. The retaliatory actions from Jordan was expected by ISIS as it was only under Islamic law that they could justify their immediate response. Is this justice? If so, where does it end? I am not suggesting that only Muslims get caught up in this cycle of revenge, but I am suggesting that only Muslims have it written into and encouraged by their holy texts. ISIS effectively dared Jordan to adopt their interpretation of Jihad in which you can hurt your enemy with the hurt they bring upon you, which is exactly what they did. Importantly, the Qur'an states that the Jordanian governments first responsibility is to believers. I'm sure there were people in Jordon who wanted to save the Japanese hostages as well, but their hands were tied in effect by their holy scriptures. Yes, I can see that there are verses calling for justice in the Qur'an, but what does that justice look like? I get most of my news from Al Jazeera and non-American sources. I am not "one of those Americans" you mentioned.